Is social impact the new measure of a company’s bottom line? That question provided the premise for “The Power of Purpose: The Corporate Social Responsibility Summit,” hosted by The Atlantic Thursday in New York City. Joining with business executives, community leaders, and others who gathered to examine the implications of corporations speaking out and taking action on their values, Arabella’s CEO, Sampriti Ganguli, participated in a discussion about how companies can use the many tools at their disposal to make a difference. 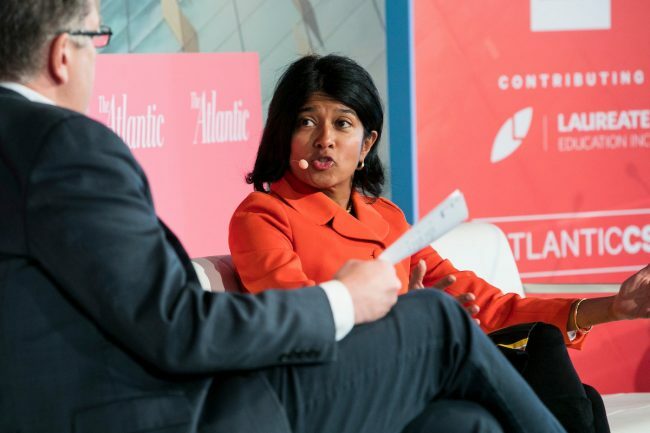 In a wide-ranging chat with Steve Clemons of The Atlantic, Ganguli noted that many companies are grappling with how to best use their voices, position, and capital to advance causes that are meaningful to them. In addition to grant making, corporate funders are looking to launch smart advocacy campaigns, pool their funds with like-minded donors, and conduct thoughtful evaluations of their work that give them the necessary insights to make a strategic pivot, if necessary. These tools, Ganguli said, enable donors of all kinds to stretch their investments—and their energies—to maximize impact. Ganguli also spoke about Arabella’s ongoing efforts to cultivate an environment—both internally and within the broader philanthropic field—that is diverse, equitable, and inclusive. Doing so is one way Arabella seeks to share our values with our clients and partners, she said, adding that other companies are doing the same.